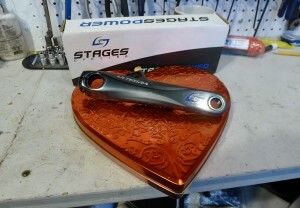 This Valentine’s day Durham Cycles was gifted with one of the first batch of Stages Cycling power meters. Below we give you a rundown of the potential benefits and drawbacks of the newest competitor in the power market and provide a real-world data comparison between the Stages meter and the PowerTap G3. So whats the down side? Stages meters can only be retrofitted to aluminum crank arms, meaning that if you’re riding Sram Red or Force you’ll have to use a Rival left arm. Stages currently has no offerings for FSA cranksets, nor do they have BB30 options outside of Cannondale Hollowgram. Given the popularity of the BB30 platform, we can only guess that Stages is having problems sourcing arms from SRAM, which owns Quarq, Stages competitor in the power market. 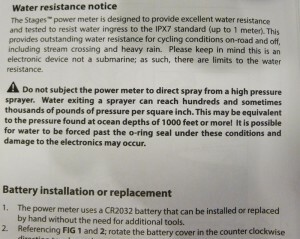 Stages addresses water resistance issues (the bane of most power meters) with a bit of humor. The stages meter comes with clear instructions and is easy to install. (Installation is the same as with any crank arm. Unlike Quarq crank-based systems, there is no need to mount an angular velocity magnet to your bottom bracket.) Like all power meters, the Stages meter should be calibrated regularly. Calibration procedures depend on the computer or application you are using. The Stages crank arm will need to be placed in the 6 o’clock position before calibration or you will receive an error message. “…I thought you would be interested in the data I collected on my ride today comparing the Stages Power on my crank with the PowerTap wheel. 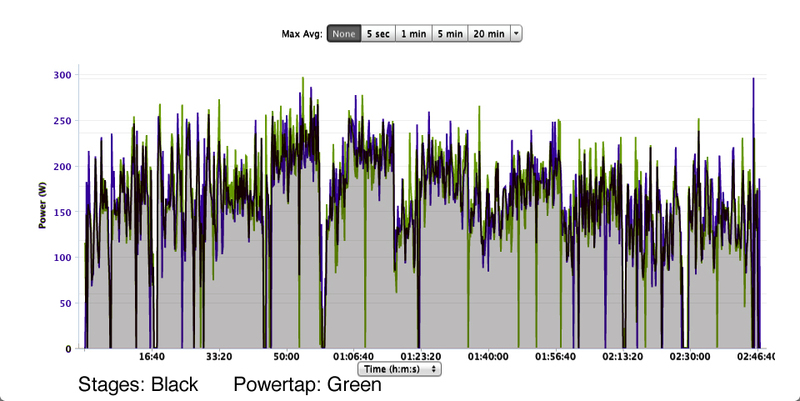 I was really pleased to see consistent the data between the two power meters. I rode 4 x 12 min intervals. The average power for these intervals was remarkably close: Stages 219W, 217W, 194W, 188W. PowerTap 223W, 218W, 196W, 187W. Probably within the margin of error. Overall we are very impressed with Stages’ offering, and we suspect that their biggest problem may be satisfying customer demand. While the longevity of the Stages meter is unknown, the company has been around for a while providing power meters for stationary bikes, which suggests they have the infrastructure and experience to deal with warranty and maintenance issues. Despite the risks inherent in being an early adopter of a new product, riders using Shimano cranks may want to seriously consider the Stages meters before investing more than twice as much in a Powertap or Quarq.